Back cover blurb: "I can still recall how cold the pearls felt on my bare neck as Mr Fitzroy secured the clasp, and how heavy they were. I also remember that they were far, far too long for me. But, oh how mesmerising I found those pearls..." Sophia Beaumont-Brown was an IT girl. But now she's in the papers for all the wrong reasons. Single, sofa-surfing and not speaking to her family, only her grandmother has any faith left in her. From her hospital bed, Tilly Beaumont sends Sophia letters about her life: dispatches about wartime England, about family secrets and finally, about the most beautiful thing she ever owned-a necklace of the most incredible pearls. If Sophia's prepared to listen, she'll unlock the secret story of generations of incredible women, from the pearl divers of Japan, to high society in pre-war England, and find that the necklace has changed the lives of all who have worn it. The only problem? No one knows where it is. Sophia must find out if she's ready to take on the search for something so perfect it can change a life. Wouldn't a girl do anything to hold that in her hands? The Inheritance is one of those rare lovely books sent to me by a publisher that I wouldn't have necessarily chosen to read myself. Sophia Beaumont Brown was the ultimate IT girl, but after a series of unflattering articles and untruths printed about her in the tabloids, she is on a downward spiral. Living in nothing more than a glorified squat with her best friend Hugo, Sophia has been estranged from her family for months. It's a letter from her dying Granny and an unfortunate encounter with her ex-fiancee that sets Sophia on the road to reconciliation with her family, but not before learning a few hard life lessons on the way. Sophia's Granny, Lady Matilda Beaumont (a.k.a. former Hollywood actress 'Tilly') wants Sophia to help her find the missing pearl necklace that was given to her by her beloved Father on her 18th Birthday. The only trouble is Tilly is now bedridden, and no one has seen the necklace in years. Sophia reluctantly contacts her estranged parents for help in locating the missing heirloom. To say that she doesn't exactly get a warm welcome would be a little bit of an understatement. So convinced are they that Sophia is only after her Granny's inheritance after cutting all ties with them they refuse to help. The Inheritance is a beautiful novel, and I shall be seeking out this author in the future. 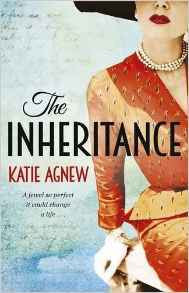 The Inheritance is available to buy now from Amazon online and all good book shops.